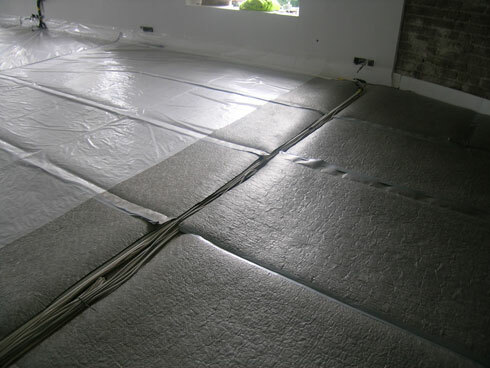 Enkasonic is a sound control matting used in floor construction and renovation. It is a composite of nylon filaments that forms a three-dimensional mat 10mm thick. A non-woven fabric is heat-bonded to the upper surface. The product was designed initially for use under ceramic tiles, however, tests carried out in the US over a decade have demonstrated it’s effectiveness under other constructions and floor coverings. 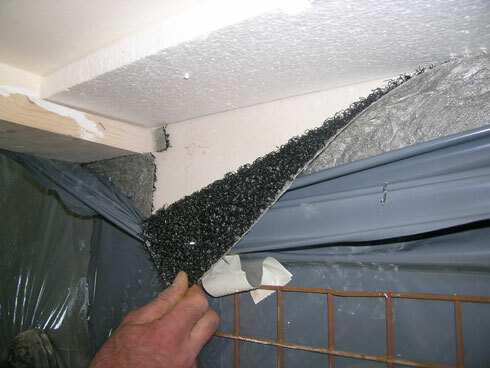 The installation process requires that an expansion strip (polystyrene or similar) is installed around the perimeter of each wall. This helps minimise flanking sounds. The Enkasonic is then laid and cut flush to the perimeter strip. It is not fixed down, as fixing of the materials all cause noise transfer. Once installed a layer of 500 gauge polythene is laid over the Enkasonic. It is sealed and taped at all joints and turned up the walls approximately 150mm. This can be cut back at a later stage. If underfloor heating pipes are being installed, they should be cable-tied to mesh (A142 or similar), rather than mechanically fixed down. This again minimises the noise transfer. Easy Screed is then poured across the floor.